WASHINGTON (AP) — Education Secretary Betsy DeVos said Tuesday that ballooning student debt has caused a “crisis in higher education,” and that the traditional path to college might not be the best choice for all students. 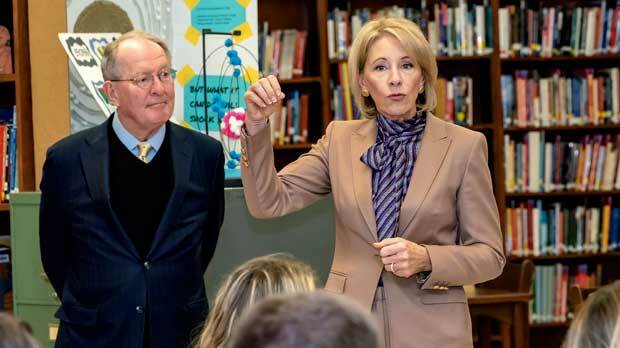 DeVos made the comments in Atlanta at a training conference for the Education Department’s Federal Student Aid division, which oversees student loans awarded by the federal government. The department released a text of her remarks. “Our higher-ed system is the envy of the world, but if we as a country do not make important policy changes in the way we distribute, administer and manage federal student loans, the program on which so many students rely will be in serious jeopardy,” she said. DeVos said the federal government holds $1.5 trillion in outstanding student loans, a threefold increase from 2007 and a $500 billion increase from 2013. She said Federal Student Aid’s loan portfolio now accounts for nearly 10 percent of America’s national debt. She blamed the Obama administration and its 2010 takeover of federal student loans, which stopped private banks from giving out federally subsidized student loans. DeVos says the decision encouraged colleges to hike their tuition rates. She said most of the loan growth since 2010 is tied to individuals taking on more debt, rather than a growing number of students taking out loans. She said 70 percent of the growth is tied to increases in individual debt, while 30 percent is driven by growing numbers of borrowers. As a result, she said, many students are struggling to pay off their debt, with 43 percent of all loans considered “in distress” by the federal government. DeVos didn’t propose specific changes but laid out “core principles” that she said must guide changes to the student loan system. Chief among them is an emphasis on helping students find “the education that’s right for them,” even if it isn’t a traditional four-year university. She also pushed for greater innovation in education, and better information to guide families and policymakers. DeVos said the federal government must become a “more responsible” lender, but also said schools and families should bear greater responsibility as the nation tackles its student debt woes.